^ Fiegerman, Seth (June 13, 2017). "End of an era: Yahoo is no longer an independent company". Archived from the original on June 13, 2017. Retrieved June 13, 2017. 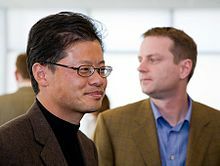 ^ "Yahoo Era Ends Verizon Closes $4.4 Billion Buyout". June 13, 2017. ^ McGoogan, Cara (July 25, 2016). "Yahoo: 9 reasons for the internet icon's decline". The Telegraph. Archived from the original on April 17, 2018. Retrieved April 4, 2018. ^ "The Glory That Was Yahoo". March 21, 2018. ^ Chokshi, Niraj; Goel, Vindu (April 3, 2017). "Verizon Announces New Name Brand for AOL and Yahoo: Oath". The New York Times. Archived from the original on April 4, 2017. Retrieved April 4, 2017. ^ Cooper, Chet; Angeles, Liz (February – March 2011). "Yahoo! and Accessibility". Ability Magazine. Archived from the original on October 4, 2012. Retrieved July 30, 2012. 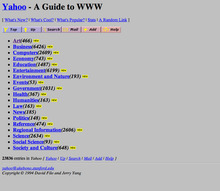 ^ "A browser from Yahoo! makes surprise debut". May 24, 2012. Archived from the original on October 31, 2012. Retrieved October 16, 2012. ^ Rossiter, Jay (June 28, 2013). "Keeping our Focus on What's Next". Yahoo Tumblr Blog. Yahoo. Retrieved April 11, 2019. If you installed the browser plug-in, it will no longer work. If you downloaded the app, it will continue to work, but won’t be actively maintained. ^ "Yahoo Detects Hacking Attempt on Email Accounts". Thomson/Reuters. January 31, 2014. Archived from the original on February 2, 2014. Retrieved January 31, 2014.